With the relaxing of the Penal Laws the first church was built at Ransboro. It was a small building with a thatched roof. The roof was constructed of the ribs of a whale. Here the people of Kilmacowen and Killaspugbrone – present day Coolera/Strandhill – heard Mass on Sundays and Holy Days. Father O’Callaghan, who was Parish Priest of Coolera, built the old church of Ransboro in the early 1850’s. It was then a plain building running east to west. The Altar was against the side wall on the south side. Father O’Callaghan also began construction of the tower, and it was completed by Father Quinn in 1860. The church itself was then extended backwards to meet the tower, and a gallery was added. Father Quinn also beautified the outside of the church, planting flowers and a shelter belt of trees. In 1899 Father J. Brennan added two porches, put a ceiling in the church and stained glass in the windows. In the early 1930’s Father Patrick Kelly improved the avenue that led to the church, and placed a statue of the Sacred Heart in the grounds. When this church was eventually sold the statue was rescued by the late Josie Devaney who restored it to its former beauty and it now stands in the grounds of Ransboro church. The old Stations of the Cross were presented to Fr. Kelly in memory of a deceased native of Coolera. This church catered for the whole area from Kilmacowen all the way down to the Strandhill area as the church in Strandhill was not built until the 1920’s. This just shows how difficult it was to get to mass in those days, as everybody had to go to mass by foot or in a horse and cart. Mass was celebrated here until 1967 when the last mass was said on 4th June 1967. 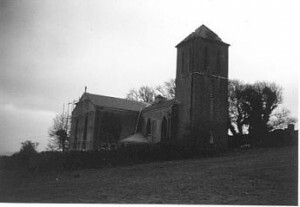 The old church at Ransboro lay idle and derelict for many years after the construction of the new church. But it has since been entirely renovated into a private home by a German couple, Werner and Rita Biederbeck. In 1940-1941 Father Michael O’Beirne carried out a complete drainage scheme on the church site and repairs to the church itself. In the late 1950’s Canon Tom Hanley was Administrator at St. Mary’s and Father Tom Moran had pastoral care of the Ransboro/Strandhill area. In October 1959 a public meeting of Ransboro parishioners was held in Kilmacowen Hall. The late Joseph Roddy chaired the meeting. After discussion about the renovation of the old Ransboro church it was felt that a considerable sum of money would be required to carry out the work. It was decided instead to examine the possibility of erecting a new church to replace the old church at Ransboro. A decision was later taken to build the new church at an area known as the Red Gate. Father John Egan was appointed to the Ransboro / Strandhill area in 1962. Under him, work on the new church began and the foundation stone was blessed and laid on 31st May 1965 the Feast of Our Lady Queen of the Universe. 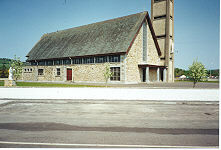 The church was officially opened and blessed by the Most Reverend Dr. Hanly, Bishop of Elphin, on 4th June 1967. It is dedicated to Our Lady, Star of the Sea. Its simple splendour blends with the majesty of Knocknarea in the background. It is a fitting monument to the dedication, hard work and sacrifice of all who helped to make it a reality, and especially to Father John Egan, under whose painstaking supervision and expertise the architects’ design was so beautifully executed. Visitors are loud in its praise and delighted to find this jewel in the heart of the Yeats Country. Fr. Gerald Donnelly and Fr. Desmond McLoughlin undertook the continuing onerous task of reducing the debt with great success. Through their efforts and the perseverance and co-operation of a dedicated group of people the debt was eventually cleared. Special thanks are due to all who made their weekly contributions and above all to the loyal collectors who so willingly persevered in an irksome task for many years. Good fortune finally came in a Prize Bonds Draw to complete the task so willingly undertaken. When the debt was finally cleared a mass of the Consecration was celebrated by Most Rev. Dominic Conway, D.D. on Sunday 8th September 1974 on the birthday of Our Lady.